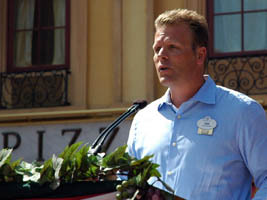 Disney ambassador Clay Shoemaker (below, left) welcomed the crowd. 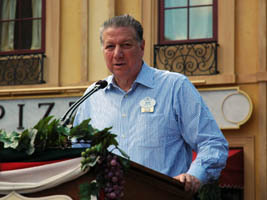 Speakers also included Epcot Vice President Dan Cockerell (below, right) who said he was “thrilled about this significant expansion”. 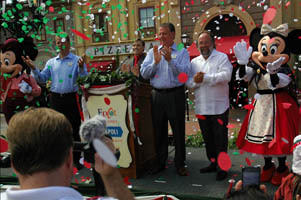 Patina Restaurant Group CEO Nick Valenti (below, left) said that he was “delighted to be bringing my passion, which is the art of authentic Neapolitan pizza, to Walt Disney World”. 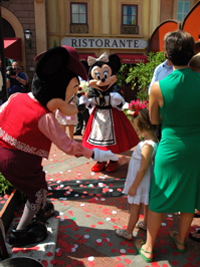 Mickey and Minnie return to the stage with the granddaughter of Mr. Valenti to assist with the ribbon cutting (below, right). 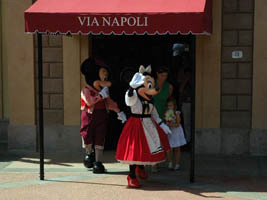 Mickey and Minnie Mouse join Dan Cockerell and Nick Valenti in cutting the ribbon to officially open Via Napoli Ristorante (below left and right). Fireworks and confetti were shot into the air and shower the crowd! 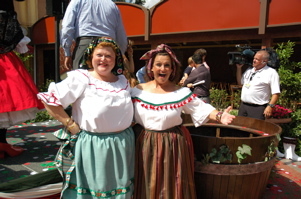 Taking a break from stomping grapes (below, left), cast members pose for a photo. 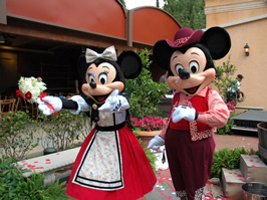 Minnie Mouse had been offered a beautiful bouquet of flowers (below, right), which she carried with her while posing for photos. 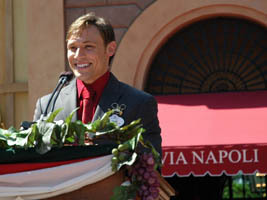 Video #1 – Epcot Via Napoli Ristorante Grand Opening Ceremony 8/5/10 – This is the opening ceremony with Epcot VP Dan Cockerell, Patina Group CEO Nick Valenti, Disney Ambassador Clay Shoemaker, Mickey and Minnie Mouse. 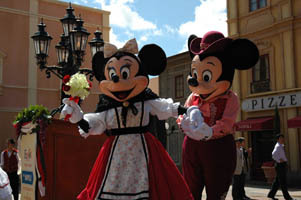 Mickey and Minnie Mouse greet a young guest (below, left). 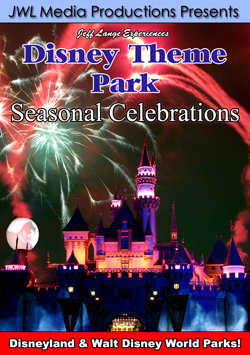 Minnie opens her arms for a hug (below, right). 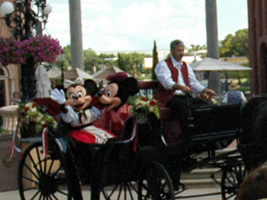 The little girl who is off-camera here ran into Minnie’s arms. 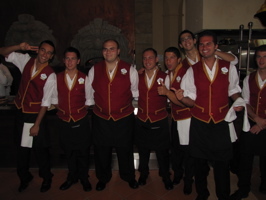 Via Napoli cast members greet guests as we arrive into the restaurant (below, left). 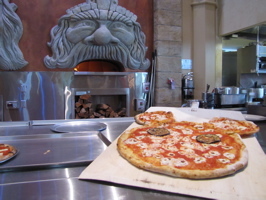 A Mickey shaped pizza is seen in front of one of Via Napoli’s 3 ovens (below, right). 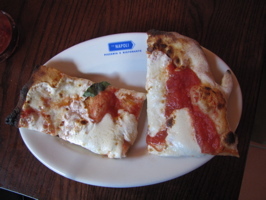 Video #2 – Patina Group CEO Nick Valenti Tells Back Story of Via Napoli at Epcot – Patina Group CEO Nick Valenti about the back story of the restaurant (I had heard some of it previously, but not quite correctly). 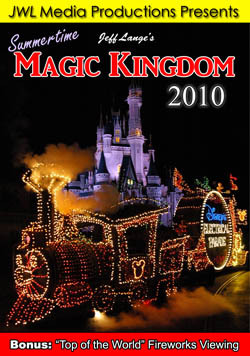 It’s common at Walt Disney World for attractions, restaurants and even shops to have a back story and it makes it more interesting! 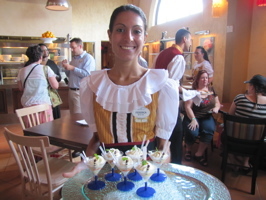 A Via Napoli server holds a tray of Gelato Frizzante ($9) desserts (below, left) This dessert is described as “Ice Cream Soda, Italian Style”. 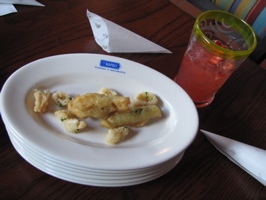 We really enjoyed the Fritto Misto ($24), which was an assortment of calamari and just-fried seasonal vegetables (below, right). The asparagus was incredible! We were served an assortment of Acqua Fresca drinks, the strawberry is below (and includes fresh strawberries in the glass). These are $5 and don’t include refills. 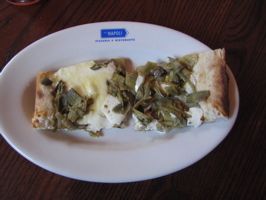 We tried an assortment of pizza slices, including the Carciofi with artichokes and pecorino cheese (below, left) and the Margherita (below, right). 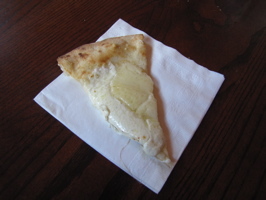 Two more slices include the Quattro Formaggi (3 cheese pizza), and a slice not listed on the menu – we didn’t taste any cheese, but this was actually a favorite of ours! 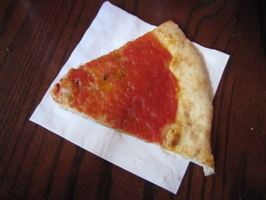 We were told that it had basil and olive oil on it, and I never thought it’d be as tasty as it was. 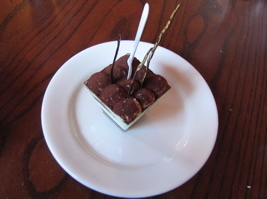 The tiramasu ($8) was creamy and wonderful (below, left). 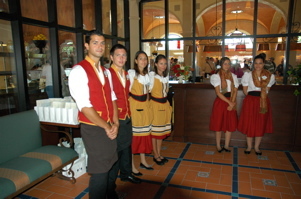 Arrivederci from the staff of Via Napoli as we exit the resturant (below, right). 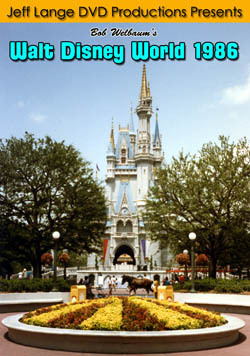 In keeping with the Epcot spirit of today’s update, I present my Epcot Center Historical Collection to relive these wonderful memories or experience them for the first time! 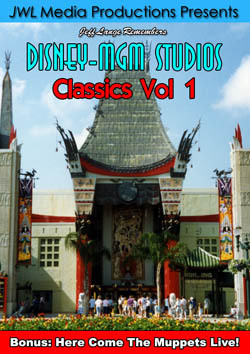 Click HERE for more information or to browse all of my Epcot Center DVDs!